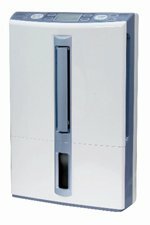 The Mitsubishi MJ-E16VX Dehumidifier is identical to the MJ-E16V in general performance but has even more useful features. In gaining features the Mitsubishi MJ-E16VX has sacrificed nothing and is a pleasingly quiet dehumidifier equally suited for use in a boat or as a garage dehumidifier. It retains all the advantages of style, compactness, portability and effectiveness while offering even more functionality. We will not repeat the description already given of the MJ-E16V but concentrate instead on the enhancements incorporated in this model. This dehumidifier comes with a more advanced humidistat that is accurate to within +/-1% relative humidity. Typically the humidistats used in home dehumidifiers are only accurate within a 5% range. This is adjustable between 50% and 70% RH in 5% steps offering finer control of humidity. This may be more control than some people need or want, and the machine will do the work for you if you prefer, but for others this can be an advantage. If, for example you have a good quality piano in your home you will be aware that significant fluctuations in relative humidity can affect the performance of, even cause permanent damage to, your instrument. The ability to control humidity with greater precision can be essential to those of you with this or a similarly sensitive problem. The Mitsubishi MJ-E16VX Dehumidifier adds two additional drive modes to the five found in the MJ-E16V. Low, low temperature, laundry and air purifier modes remain the same. The auto mode function is renamed easy dehumidifying mode but otherwise remains the same. The first of the new modes is auto mode which is rather different from its namesake in the MJ-E16V. This is the mode where you can set the level of relative humidity, between 50% and 70%, which you wish the dehumidifier to maintain. Once set the dehumidifier will operate while that level is exceeded and stop when it falls below. The second addition is mildew guard mode. In this mode the dehumidifier works intermittently for periods of 2 or 4 hours throughout the day. It controls the spread of mildew because the fungus cannot produce spores when it is too dry. Two hours at 40%RH or four hours at 50%RH will have this effect and the dehumidifier selects the appropriate time period according to the humidity level in the house. Please note that this feature cannot remove existing mildew. Although the air purifier mode remains the same it now operates more effectively, as do all other modes, to purify the air. This is because an antibacterial, deodorant Photocatalytic Filter is installed in the Mitsubishi MJ-E16VX Dehumidifier. This filter can be washed by soaking in water and dried in the sun every three months or so to regenerate its deodorizing capability. The filter will need replacement every two years. Replacing the simple off-timer of the MJ-E16V is an on/off timer which can be set for any time from one to nine hours. The dehumidifier also includes a child lock to prevent little fingers upsetting your carefully selected programme. Yet another additional feature is the swing louvre function which allows the louvres to be adjusted to direct the flow of dried air to suit your requirements. You might, for example, wish to direct the air upwards if you are drying laundry, or towards the open door of a closet it you have a particular problem with damp inside. All of these new functions can be enabled from the electronic control panel which, on the Mitsubishi MJ-E16VX Dehumidifier has a Liquid Crystal Display (LCD) which also shows the relative humidity in the room at any time. All other features, if not improved, are retained, including hot gas defrost, continuous drainage, auto restart after a power interruption etc. The most valuable characteristic of the Mitsubishi MJ-E16V Dehumidifier remains its reliability. In dehumidifier reviews written by consumers the Mitsubishi MJ-E16VX is as popular as the MJ-E16V. Users appreciate its power and effectiveness. Consumers with damp and mould problems report that it has eliminated these within a few days and that the problems have not recurred. The low noise output of the Mitsubishi MJ-E16VX has also been remarked upon and compared favourably with the levels produced by other brands. Users who have used the Mitsubishi MJ-E16VX in cold garages and workshops, even one where the inside temperature dropped below freezing at night, have reported excellent results. One reviewer reported using the MJ-E16VX in a garage for four years: it was still going strong. Consumers who have used the Mitsubishi MJ-E16VX have praised the adjustable louvres, which direct the air-flow, and this dehumidifier appears to be even more effective in laundry mode that the MJ-E16V. The main causes of complaint are that the hose required is not supplied with the dehumidifier, and about noise. All dehumidifiers receive criticism about noise. This dehumidifier is quieter than most others but is not silent. All consumers are pleased with the build quality and reliability of the Mitsubishi MJ-E16VX Dehumidifier. In our view the Mitsubishi MJ-E16VX Dehumidifier is every bit as good as the MJ-E16V, only better. It is as effective a dehumidifier for the home, or as a garage dehumidifier, a boat dehumidifier or for use in any other cool area. It is superior as a laundry dryer and is more precisely controllable wherever it is used. It has an even wider range of features and is more versatile , with seven operating modes. It is a small dehumidifier with compact dimensions and of light weight. It is stylish and pleasing to the eye.